Denim fades naturally over time with wear and repeated washings, but to fade jeans more quickly, get creative. You may want to lighten up new jeans for summer wear or fade certain areas for a chic distressed look. Save your money and give those dark denims a whole new life. To fade an entire pair of jeans, fill your top-loading washing machine with water and add 1/2 cup of laundry bleach. 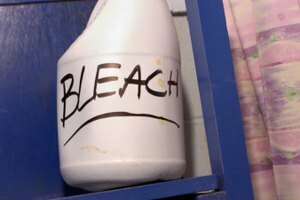 Let the wash cycle start so the bleach and water mix together evenly. Stop the wash cycle and add your jeans. Let them soak in the wash for a few minutes and then continue the wash cycle. Dry the jeans normally. 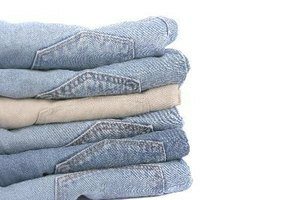 To fade jeans just slightly, wash them on the hot water cycle. Put them in the dryer on the hottest setting to dry. Repeat until you have reached the desired amount of fading. Be aware that the hot temperatures may shrink the fabric. 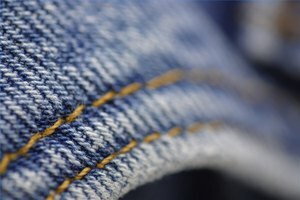 To spot fade jeans in particular areas, put them through a normal wash cycle. Remove the damp jeans from the wash and lay them on an old towel. Pour some bleach into a bowl. Dip the sponge into the bleach and wring it out. Rub the sponge over the spots you want to fade, such as along the length of the thighs and over the knees. Hang the jeans to dry in the sun. Spot fade jeans by placing a mixture of water and bleach in a spray mist bottle. Mist the areas you want to lighten for a more subtle look. Fade and distress jeans with a metal bristle brush or fine sandpaper. This method works well on dark denim. Rub the areas of the jeans you want to fade with the tool until they fade to your satisfaction. Combine any of the methods as you like. For example, do a light fade with hot water, then add to the distressed look with sandpaper. Experiment and test your technique on an old pair of jeans you don't care about first.